Every now and then entomologists get calls that border on the bizarre. Last week I received an email from a citizen in far east Texas. He was having problems with what he said were “insects boring into his riding lawn mower gas tank”. Of course my first reaction was that insects don’t eat plastic, nor do they drink gasoline. Why should they be boring into a gas tank? But the caller had photographic proof. Not only did he have pictures of the holes, he was able to pry about 15 of the crazy insects from the plastic can and take pictures of some of them. Two holes (see arrows) in the gas tank of a riding mower made by the exotic camphor shoot borer, Cnestus mutilatus. Photo by Adam Sheffield. And this wasn’t an isolated case, according to the caller. His neighbor claimed to have had a similar experience with his mower being damaged by these same little pests the previous spring. I’ve learned that being good at my job doesn’t mean that I have all the answers; but it does mean I need to know where to go for them. In this case I got lucky. I put out an email inquiry about gas sniffing beetles to colleagues, and immediately got replies. Cnestus mutilatus, the Camphor shoot borer, is a stubby little (3-4 mm) insect that normally bores into trees. Photo courtesy Kira Metz, USDA/APHIS. As happens too often these days, the CSB is yet another insect that’s not native to this country. It was first reported in the U.S. in 2004, and is now found throughout the Southeast from NC to TX. It normally feeds on a variety of hardwoods, especially sweetgum. In Texas it’s more likely to be found in the eastern part of the state. One entomologist pointed out that he has noticed these beetles often come to his alcohol-baited traps used to collect other bark beetles. Most gasoline these days contains alcohol, so, putting two and two together, we can assume that alcohol is likely what’s attracting these little guys to lawn mowers. How can we use what we know about this insect to prevent it from ruining lawn mowers, and perhaps causing fiery mayhem from Charlotte to Houston? A glance at the collection data stored on BugGuide suggests that this beetle is active primarily in the spring (March to June). Storing gas canisters and mowers in enclosed sheds or under some type of tarpaulin may be helpful, especially in the spring. 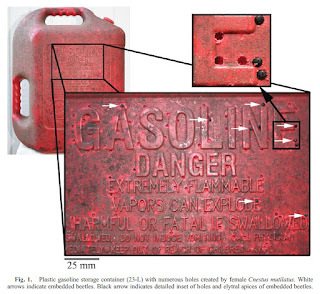 Keeping the outside of the plastic fuel canisters free of spilled gas also might help. In the case of our caller, his mower was stored in a half open car port setting. If he could find gasoline without ethanol he might not be plagued any more; but these days that might be harder than building a new shed for the mower. Coincidentally, this week there’s a new report of an insect that actually does eat plastic. The wax moth, Galleria mellonella, is a caterpillar that normally bores into bee hives and consumes and digests the hive wax. According to researchers at Cambridge University, the caterpillars are able to break down the chemical bonds of plastics much like they do wax. The biochemists are so intrigued about the possibilities of a moth that can live off of our plastic waste that they have patented their discovery. So a toast this week to bizarre insects! Boozy beetles and the plastic eating caterpillars may both like to bore, but they are definitely not boring. This entry was posted in Exotic pests, Interesting insects, News and tagged camphor shoot borer, Cnestus mutilatus, Galleria mellonella, wax moth. Bookmark the permalink.